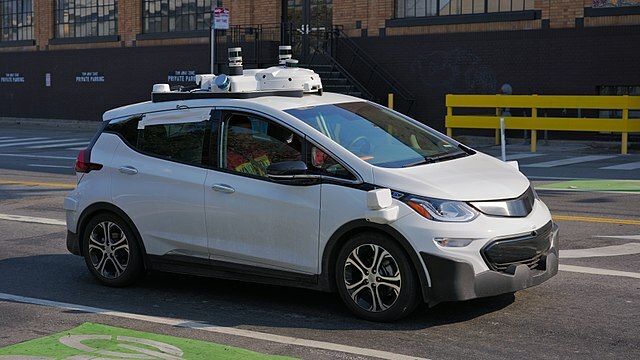 Connected and automated vehicles (CAVs), also known as driverless or self-driving cars, have been widely proposed as a strategy for reducing transportation energy use and emissions. Yet while CAV technology has the potential to yield environmental benefits, those benefits are not guaranteed. Beneficial outcomes can be achieved in a variety of ways, leaving the magnitude and sign of associated environmental impacts highly uncertain. Taiebat et al. (2018) provides a comprehensive overview of mechanisms through which CAVs interact with the environment and also identifies key research needs for better understanding of sustainable adoption of CAV technology. In analyzing the potential environmental impacts of CAV technology, Taiebat et al. (2018) considers interactions at different scales summarized in Figure 1. CAV technology can improve fuel efficiency and reduce emissions through energy minimization algorithms including more efficient driving cycles, optimal routing, less aggressive acceleration and deceleration, intelligent speed harmonization (such as matching speeds between nearby vehicles), and decreased idling. At very high penetration levels, CAVs are likely to minimize the risk of traffic accidents, requiring less safety equipment and enabling lighter vehicles. Other environmental benefits of CAV technology include trip-specific right sizing and platooning. CAV technology can enable service fleets to dispatch vehicles based on passenger needs, improving fleet-level fuel efficiency by 30–35 percent. CAV technology also allows vehicles to travel closely together, forming “platoons” that reduce aerodynamic drag. Some vehicle-level interactions have negative environmental effects. Sensors and communication equipment that add CAV capabilities may lead to additional curb weight and alter the aerodynamic shape of CAVs, offsetting the benefits described above. In addition, transportation authorities may increase highway speed limits in response to enhanced safety of CAVs, increasing the average speed vehicles operate on highways. Since aerodynamic drag rises substantially at higher speeds, increased speed limits may generate greater vehicle energy use and emissions. Levels of interactions between CAVs and the environment with positive (+) and negative (-) impacting mechanisms. Eliminating humans as drivers and service providers in CAVs makes traveling cheaper and allows people to engage in other activities while traveling, which can result in longer and more frequent trips by individual vehicles. On the other hand, integrating CAVs with mass transit can help address the “first/last-mile” problem, which may encourage more people to switch from traveling by more fuel intensive individual vehicles to utilize mass transit, resulting in overall fuel savings and emissions reductions. CAV technology can also help address challenges facing shared mobility, such as optimizing matching between vehicles, routes, and users. CAVs are therefore likely to shift the travel paradigm from one dominated by private vehicles to one relying on shared services. Large-scale CAV-enabled ride-sharing and car-sharing can increase transportation system efficiency and downsize the operating fleet, changing travel choice changes and reducing vehicle ownership. This means fewer vehicles on road, less energy consumption and material use, and smaller life cycle environmental impacts for vehicles. Due to improved communications and automation, CAVs reduce infrastructure needs like traffic lighting, signals, parking, and road lane-miles. Less transportation infrastructure needs can help cities contain their geographic footprint, ease the burden of low- or non-car ownership, and draw more people to urban centers into new developments replacing outdated transportation infrastructure. These three effects can help reduce urban environmental impacts. But CAV technology can also encourage suburban development and urban sprawl by lowering the cost and burden of vehicular travel. Furthermore, CAVs will require significant computational power, and it is unclear to what extent existing energy-intensive information and communications technology (ICT) infrastructure can accommodate high levels of CAV penetration. CAV technology can also resolve many infrastructure challenges facing electric vehicles (EVs) at the urban system level. Because CAVs can communicate in near real time with charging infrastructure to assess the availability and proximity of charging depots, issues such as range anxiety, charging station access, and charging time management will no longer be as problematic as today. In addition, integrating CAVs with automated charging technology (such as wireless charging) may enable better grid management and facilitate the use of low-cost renewable energy when it is available. By transforming mobility and changing how the transportation sector interacts with other sectors, large-scale CAV deployment’s most profound impacts would be evident at the society level. The magnitude and sign of these impacts are highly uncertain because the convenience, accessibility, and lower travel cost of CAVs may induce higher travel demand. People may be more willing to accept longer commutes and may use CAVs for shorter and intra-city trips which may have previously been fulfilled with other, more sustainable modes such as walking, cycling, or public transit. Additionally, people who cannot drive (e.g., elderly, unlicensed individuals, and people with driving-restrictive medical conditions) can travel in CAVs, resulting in greater vehicular travel demand. Widespread CAV deployment may also change the relative appeal of other transportation modes including aviation, mass transit, and rail. In some cases displacement of these modes by CAVs can result in higher marginal energy and emission intensity. Vehicle automation is also expected to eliminate jobs in the freight transportation sector, though the extent to which unemployment and job displacement will influence the sustainable adoption of CAVs cannot currently be projected. More broadly, CAVs will likely impact other industries including hospitality, tourism, legal, insurance, and sectors utilizing freight transportation due to cost changes such as food supply chain and online retail (delivery). These types of CAV-related changes are more difficult to predict, but will likely cause complex ripple effects. Finally, CAVs can help change the public perception of shared consumption by facilitating and promoting shared mobility. In a society where shared consumption is mainstream, the need for physical products—and environmental impacts associated with physical product life cycles—will be reduced. Taiebat et al. (2018) provides several principles for improving research on the energy, environmental, and sustainability implications of CAVs, aiming to maximize environmental benefits and minimize adverse consequences. 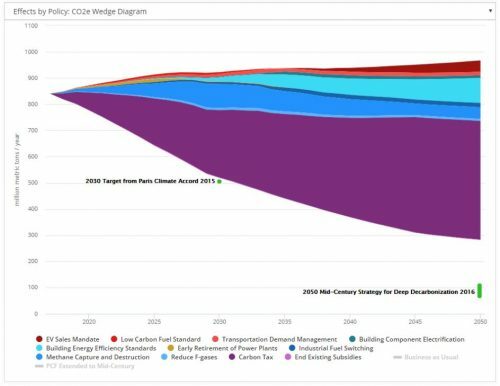 The study emphasizes that if researchers and policymakers primarily focus on vehicle-level improvements, CAVs environmental benefit projections are inclined to be excessively optimistic. The authors also argue that policy should not inhibit CAV development at this early stage, but should be prepared to steer the market to ensure positive environmental outcomes if they do not develop naturally. The authors also state that since CAVs are likely to be more efficient and generate lower levels of emissions than conventional vehicles, limiting emissions on a per-vehicle basis (existing environmental policy for the transportation sector) is less important than considering potential environmental impacts of CAVs on a broader scale. CAVs may induce travel demand that offsets—or even eliminates—improvements in per-vehicle efficiency and emissions. Other policy options suggested by this study include maintaining existing speed limits, pricing travel by distance, and enacting differential pricing based on environmental impacts. 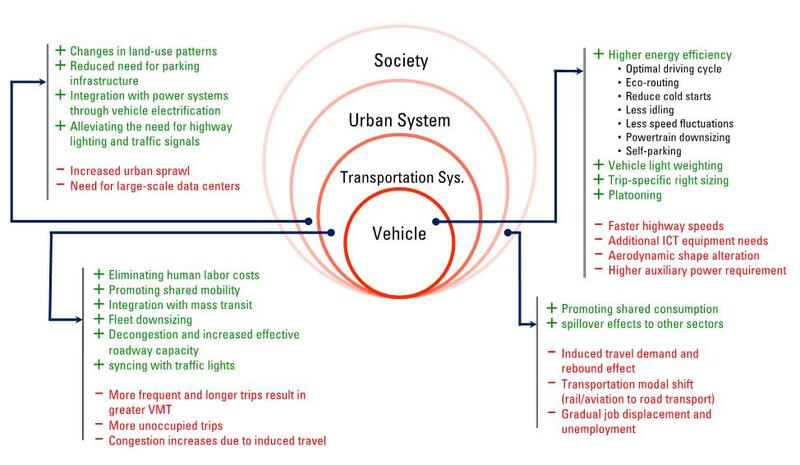 Policies should also support pooled mobility services, which alleviate most adverse environmental effects of CAV technology by ride-sharing and reducing vehicle ownership.